Marketers rely on demographics to determine the direction of their strategies. Understanding the ethnic, financial, and lifestyle aspects of the current and future population is how marketers develop their messages, so any shifts in these demographics can have an enormous effect on their efforts. According to Pew Research Center, both the look and the lifestyles of the population are undergoing a radical change. To help marketers get in tune with the demographic trends of our times, Pew Research shared five ways the world is expected to evolve. Today, Americans are more ethnically and racially diverse than they have been in history and this trend is expected to continue for many decades. 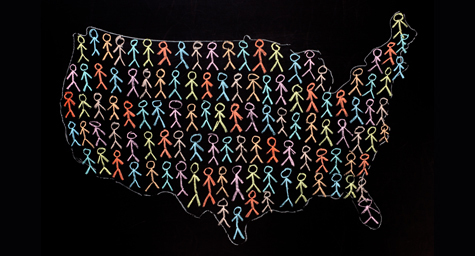 Research shows that by 2055, there won’t be any one specific ethnic or racial majority in the US. Immigration has been responsible for this demographic divergence, and Asians are the only ethnic group whose numbers are increasing over previous years and they’re expected to surpass Hispanics to become the largest immigrant category. Most racially diverse generation in US history, with 43% being non-white. Expected to become the most-educated generation. Highest student debt, due to increased education expenses. Many live at home, due to debt and weak labor market. Despite problems, they’re the most optimistic generation about their financial futures. The world’s demographic future looks very different from its present and past. From 1950 to 2010, the US population doubled, while the world’s population almost tripled. Yet this growth is expected to slow substantially between the years of 2010 and 2050, and to strongly skew toward the oldest demographic groups. The share of American adults who have never been married has reached an historic high. Divorce, remarriage, and cohabitation are increasing in the US. Number of two-parent US households is declining. Around 15% of American kids are living in blended families. The roles of mothers and fathers are blending, due in part to there being more breadwinner moms. Mothers are doing more paid work outside of the home. Fathers are responsible for more childcare and housework. Last year, the percentage of US adults in middle-income households dropped to 50%. This was a striking shift after more than 40 years of the middle class being the economic majority in the U.S. In addition, there’s a much wider financial gap between middle-class and upper-income Americans today. Research shows that 49% of US households are in upper-income brackets and possess seven times the wealth of middle-income households. The world is changing in many ways that are impacting our population. Marketers must understand these demographic distinctions and use them as a guide to make the most of their marketing. Keep up with the latest trends in marketing. Contact MDG Advertising.